When it comes to shopping for new lampshades for a lamp you bought with us or one you previously owned, you’ve come to the right place. The Lamp Connection is known for having the largest inventory and selection of lampshades in the state of Florida, so when you shop with us, you’re all but guaranteed to find a lampshade that fits the style of your lamp, as well as the style you’re looking to create in your home. If you can’t, don’t worry. We also have a selection of fabrics with which we can create lampshades. Additionally, we can create new shades with a variety of materials you bring to us. 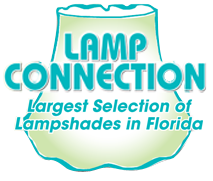 It’s simple: At the Lamp Connection, you will find the BEST selection of shades on the Treasure Coast. We offer distinctive lampshades in a wide array of sizes, shapes, colors, and fabrics. Many stock lampshades are handmade and washable. We offer lampshades of every style and size, ranging from 3-inch chandelier sizes to as large as 26-inch floor shades. Shades are made from cotton, linen, silk, wicker, parchment, corduroy, seagrass, rattan, and other materials. It can be daunting to step into our showroom and try to search for the right lampshade among the endless selection we have in stock. That’s what our staff is for. It works best (if you’re not buying for a lamp you bought with us during your visit) to bring the lamp with you to ensure that the lamp and the shade go together. This applies to lamps you’ve bought with us in the past, as well as lamps from other sellers. Looking at the size and style of the lamp will narrow down your choices, and with our help, this can guide your decision. You’re bound to have certain preferences in shape, color, style, and material, which will further narrow down your options. Once you have a selection of finalists, the team at The Lamp Connection will help you test them out and choose the one that fits best with the style of your home, your lamp, and your personality. If you don’t see a shade that fits your unique style and personality among the endless selection you can choose from, don’t worry. We can create a lampshade in any size, shape, color, style, and material for any lamp. We have a selection of fabrics we often use to create custom shades. If you don’t see one that meets your needs, you’re welcome to bring in a fabric or material of your choice for us to use to create a custom lampshade. You are welcome to bring in your own material, fringe, beads, ribbon, tassels, or other decorations, and we will customize to your unique vision. For example, we recently made shades from a French silk scarf and one from a Lily Pulitzer shower curtain. To learn more, call (772) 221-0222 today!